When faced with the age old question of pie vs. cake, I come down firmly on the side of pie. Sweet, fruity, flaky pie gets my vote every time. But that’s not to say that cake can’t be great. 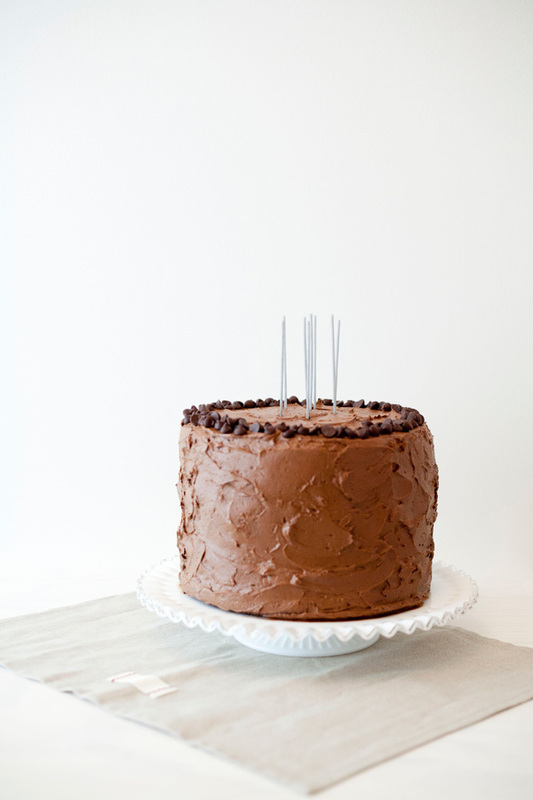 A nice, dense olive oil cake can certainly make me swoon, and I think we can all agree that a birthday party just isn’t a birthday party without a pile of sparkly candles on top of a big tall chocolate cake with cookie dough inside — especially when you’re counting on those candles to usher in a wish as important as this. And while I’ll admit that I’m less inclined to bake a cake than a pastry or pie, I’ll also tell you that this guy was a very, very good cake. A bit of a Frankenstein, yes — but the kind of Frankenstein that’s filled with light, airy whipped buttercream and rich, moist chocolate cake dotted with cookie dough and melty chocolate chips. Let’s just say I wouldn’t recommend it often — but if you are gonna have cake, it had better be a really great cake. And I think this one fits the bill. Preheat oven to 300°F. Grease pans and line bottoms with rounds of wax paper. Finely chop chocolate, then combine with hot coffee. Stir until chocolate is melted and mixture is smooth. Let mixture stand, stirring occasionally. Sift together sugar, flour, cocoa powder, baking soda, baking powder, and salt in a large bowl. In a second large bowl beat eggs with an electric mixer until they thicken slightly and begin to change to a lemon color. Add oil, buttermilk, vanilla, and melted chocolate mixture to eggs slowly, and beat until combined. Add sugar mixture to egg mixture and beat until just combined well. Divide batter between pans, leaving about a 1/4 to 1/2 inch more room than you usually would. You’ll make up that room when you add the cookie dough. Drop cookie dough into batter in small clumps (about a teaspoon at a time). Space well throughout, as they won’t move when they bake. Don’t be afraid to use quite a bit, they’ll bake up nice inside like little prizes, and the more you find the better. If you have cookie dough left over, freeze and use for a snack later (obvs). Bake layers in the middle of your oven until a tester inserted in center comes out clean, 1 hour or so. Cool layers completely in pans on racks. Run a thin knife around edges of pans and invert layers onto racks. Remove wax paper very carefully and leave layers to cool completely. 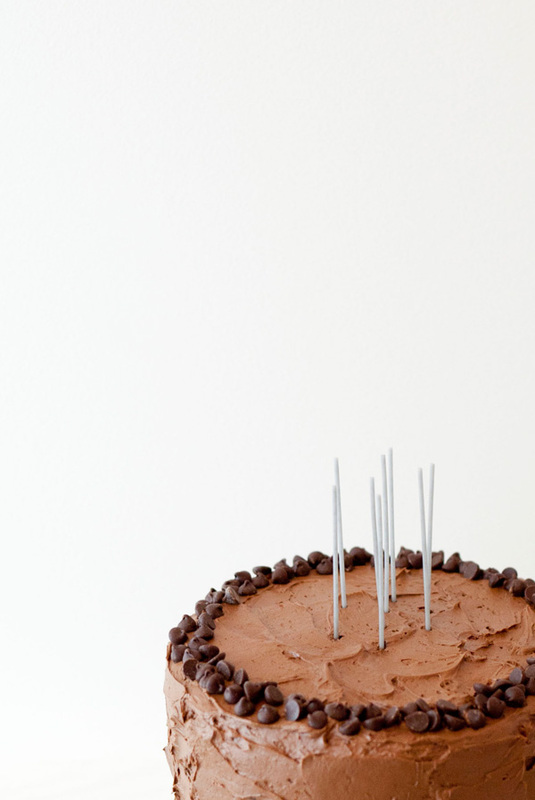 Cake layers can be made 1 day ahead and kept, wrapped well in plastic wrap, at room temperature. Combine butter and powdered sugar in a large bowl. Use a stand or handheld mixer to beat the butter and powdered sugar together until the mixture is light and fluffy, about 4 minutes. Add the cocoa powder and vanilla and beat, scraping down the sides as needed another until fully combined. Add heavy cream, one tablespoon at a time, and whip frosting until light and fluffy, 2-4 minutes. 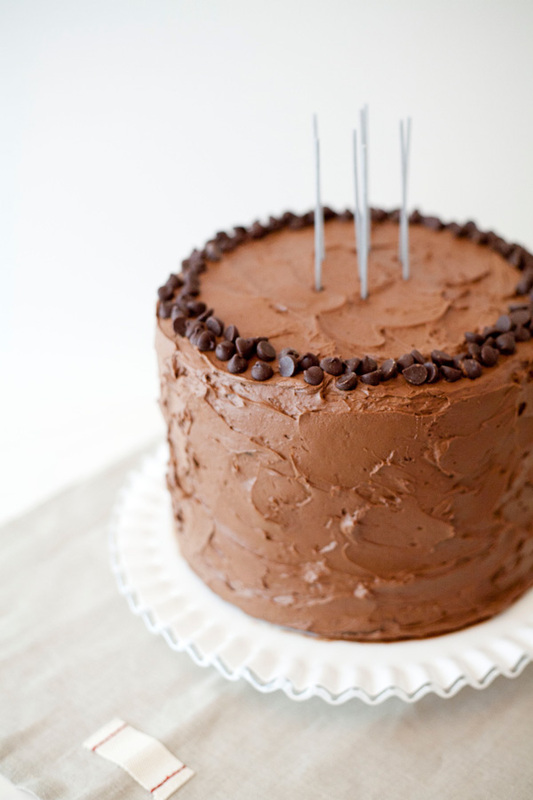 Frost between layers and on the outside of your cake. 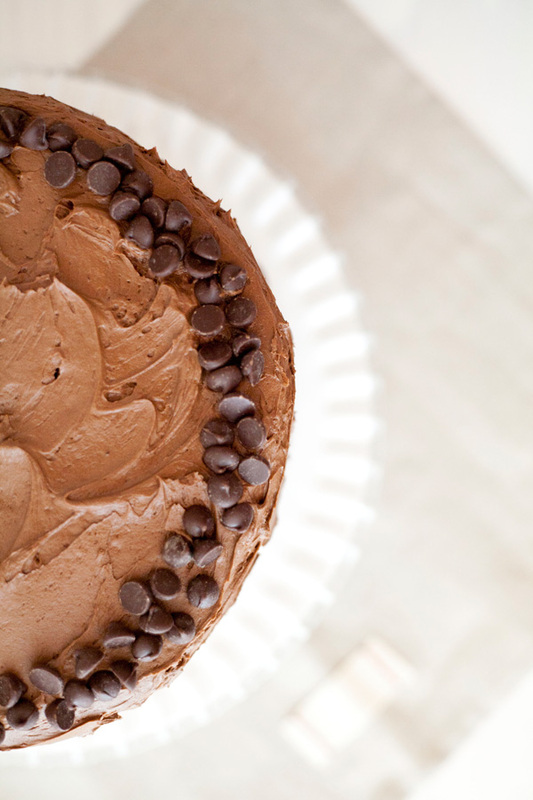 Decorate with extra chocolate chips if desired. Oh my goodness, I could get definitely get down with a slice that of that beauty! About how many pans did it take to bake this? What size pans? Oh yummm!!!! This looks so delicious…I’d say that I’m equal when it comes to pie and cake. Although, I’m not so much of a fruit pie kind of gal. In fact, I’d much rather have a delicious chocolate cake over ANY.THING. My boss just caught me looking at this and wasn’t even mad haha. It looks so good!